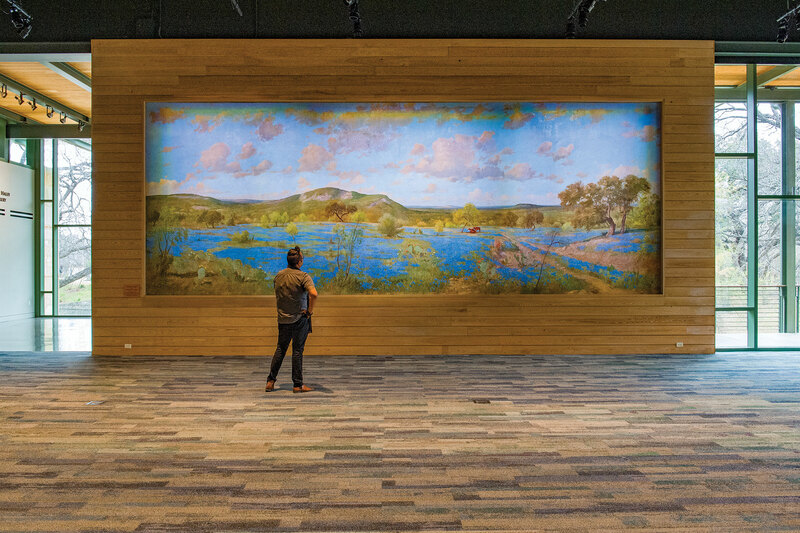 A Porfirio Salinas painting that once served as a diorama backdrop at San Antonio’s Buckhorn Saloon and survived a fire now resides at the Witte Museum. 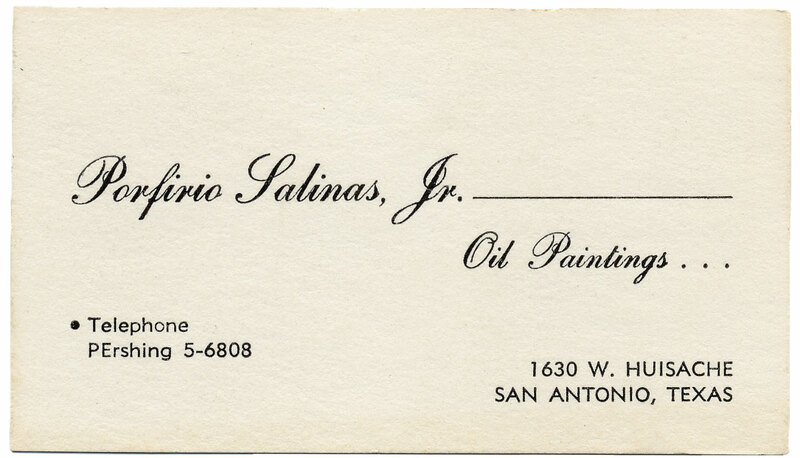 Porfirio Salinas’ paintings graced LBJ’s White House. White clouds saunter across the summer sky over a bluebonnet-dotted field. The leaves of a stately live oak shimmer in the changing light. Gaze long enough and you may feel the soft sigh of a river breeze or hear the shriek of a red-tailed hawk soaring nearby. Without a word, you know where you are. Porfirio Salinas’ painting of this pastoral Hill Country scene hangs at the ranch house at Lyndon B. Johnson National Historical Park near Johnson City. The 36th president deemed Salinas his “favorite artist,” and the Texan’s wildflower paintings adorned the White House during the Johnson administration. “I want to see them when I open the door, to remind me of where I come from,” former first lady Lady Bird Johnson said. Many homesick Texans share Lady Bird’s longing for Texas’ natural beauty. Salinas’ paintings depict realistic Texan landscapes: rolling hills and dirt roads, ranch gates and flowering prickly pear cactus, majestic oaks and his favorite subject, masses of bluebonnets emerging in early spring. Today, Salinas is revered as one of the best early Texas landscape and impressionistic landscape painters of the 20th century. Jeffrey Morseburg is an art historian based in Los Angeles who has a specific interest in early Texas art, including the work of landscape painters such as Salinas, Robert William Wood and José Arpa. Salinas was one of the first Mexican-Americans in the 20th century to become widely recognized for his painting. He was born Nov. 6, 1910, near Bastrop to tenant farmers, who soon gave up that work and moved Salinas and his siblings to San Antonio. Salinas was a “boy whose textbooks were seldom opened and whose sketchbook was never closed,” according to a 1964 profile by the New York Times. Salinas received little formal education as a child but drew and painted incessantly. At 15, Salinas was working at an art store when he met and hired on with English-born landscape artist Robert William Wood. As Wood’s assistant, he learned the basics of becoming a professional painter. 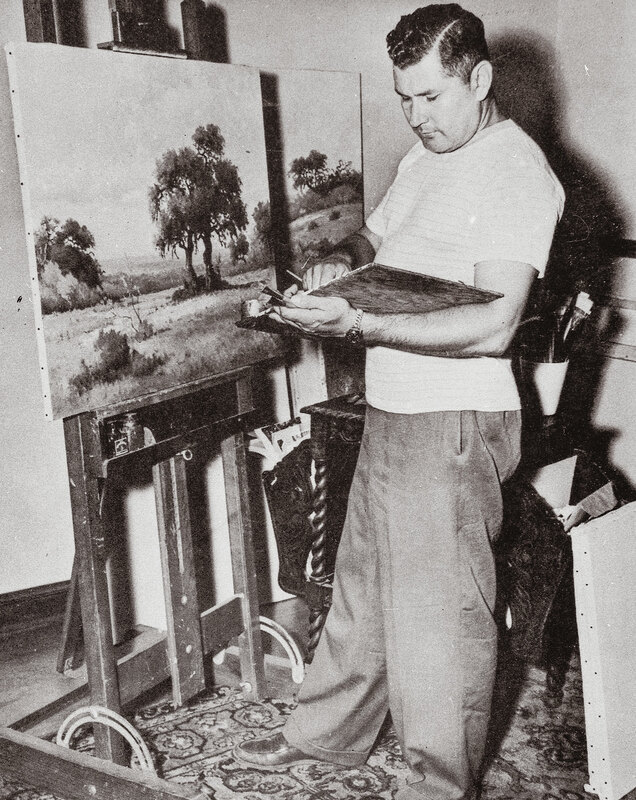 Salinas accompanied Wood and Spanish-born artist José Arpa on drawing trips to the hills outside San Antonio to try his hand at plein air (“in the open air”) paintings of Texas bluebonnets in the spring and Texas red oaks in the fall. Wood described Salinas as his “paint boy,” assisting in the studio by mixing paints and stretching canvases, a sort of apprenticeship. Wood worked from his easel in the store window of his gallery on Houston Street in San Antonio, painting where passers-by could watch. While Wood didn’t care for painting bluebonnets (and sometimes asked Salinas to paint the blooms into Wood’s canvases), the state flower captured Salinas’ imagination, and he never tired of interpreting the subject. Salinas had the ability to capture a moment in time with a sense of distance and depth in his paintings of rolling Texas hills. His treatment of the Texas bluebonnets and the landscape has inspired many other artists to strive to capture similar vignettes, Jacobson says. Salinas married Maria Bonillas from Guadalajara in 1942 and enlisted in the United States Army the following year. His military service included creating paintings for officers and officer’s clubs at Fort Sam Houston. Salinas at work in about 1950. 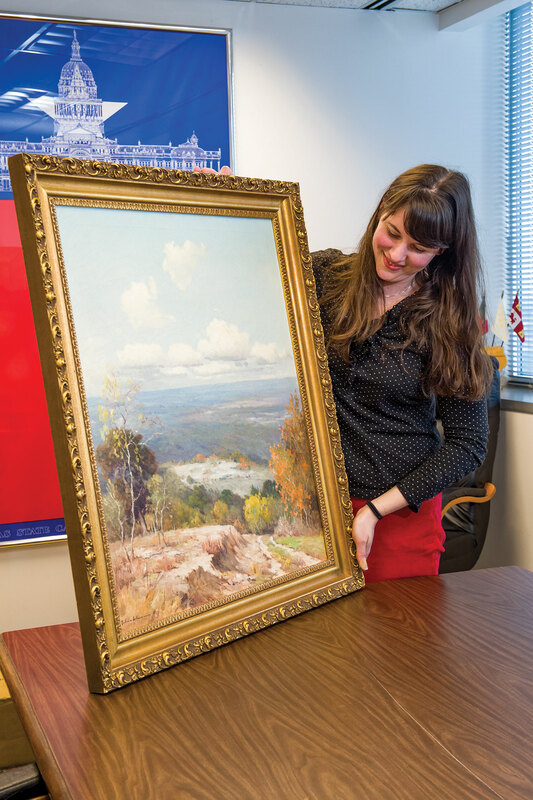 Michelle Lambing of the State Preservation Board inspects a painting by Porfirio Salinas. A Salinas painting hangs in a corner of the Governor's Mansion. After the war, as the American economy grew in the late 1940s, Salinas began to sell paintings at Dewey Bradford’s Country Store Gallery in Austin. Bradford introduced numerous Texas political figures of the day to Salinas’ work, including future President Lyndon B. Johnson. Then-U.S. Sen. Johnson became an avid collector of Salinas’ paintings in the 1950s, bringing these works with him to the White House and into the public eye in 1963. Johnson befriended his fellow Texan, inviting Salinas to join him at the LBJ Ranch frequently during his administration. 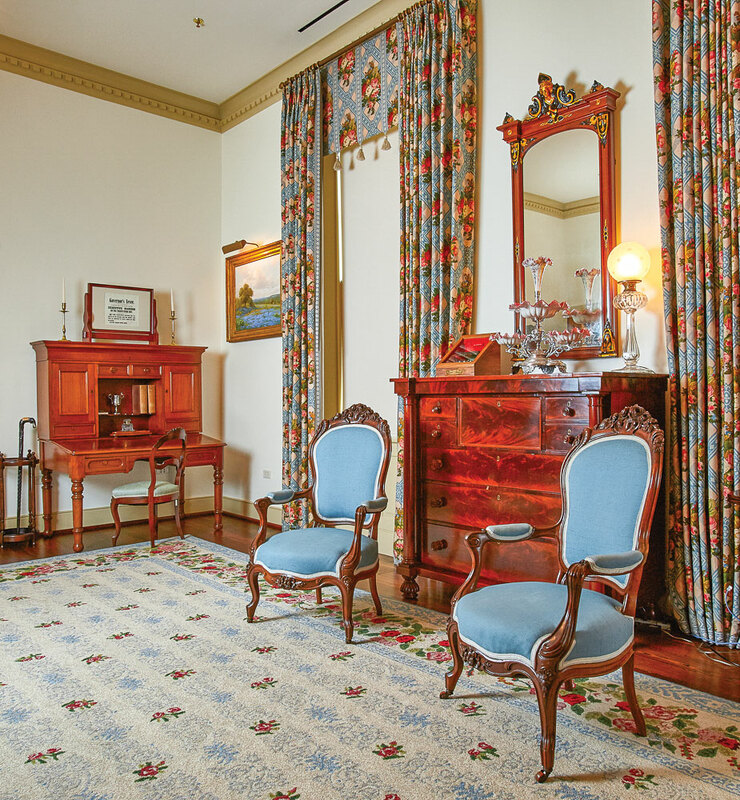 Salinas’ paintings hung on the walls of the Johnsons’ bedroom in the White House, and two of his smaller works were placed in the presidential study next door. “His work reminds me of the country around the ranch,” Johnson once remarked. Lady Bird even commissioned Salinas to paint her husband’s favorite scenes of the Pedernales River. Salinas’ professional career spanned four decades, with 2,000–3,000 paintings to his credit. Salinas died on April 18, 1973, at the age of 62, just three months after Lyndon Johnson’s passing, survived by his wife and their only child, Christina Maria Salinas. Since 1981, Bastrop has hosted the annual Porfirio Salinas Art Exhibition in the painter’s honor.